Art Materials: "danger on the edge of town"
There are multiple threats to our health in today's world. Art materials should not be among them. Artists are exposed to a number of potentially harmful chemicals and particles. Department store air purifiers are not up to this challenge. Each art has its distinct hazards; pottery's dust and lead glazes, toluene-based paint and printing solvents, turpentine in oil painting, and sand/rock dusts from sculpture. Stories of artists who have had health issues with their media are legion. Historically, the greatest hazard to artists was lack of awareness of the dangers of their materials and techniques. "Lost in a Roman wilderness of pain. And all the children are insane"
Health hazards have been associated with the fine arts since the 1700's. Illnesses, toxins, and drugs have influenced the lives of many composers, poets, sculptors, writers, playwrights, and classical painters. Colors that characterize many of the Old Masters' classic paintings reflected the use of toxic heavy metals. Pigments were often based on lead, mercury, arsenic, cobalt, cadmium and manganese. These materials may have caused disease in artists such as Rubens and Renoir. Perhaps the best known tortured artist was Vincent Van Gogh (1853-1890). 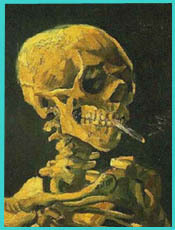 A visible evolution of style and behavior has stirred debate about Vincent's health. Van Gogh's changes are frequently attributed to toxic substances administered by the medical profession: mercury and digitalis. Others suggest that occupational exposures were at least partly to blame. The impasto technique, based on thick layers of paint, employs bright colors with a high lead, cadmium, or mercury content. Vincent was said to have been literally immersed in his work, to the point of using his fingers on the canvas. 20th century pop icons Hendrix, Joplin, and Morrison are not the only modern artists exposed to chemicals. Trends in modern art have exposed artists to a much wider range of media, as well as classic hazards. Studies have begun to identify and analyze physiological harm from art materials. Exposure levels found in studio settings may exceed industrial standards. "Shadows of the evening crawl across the years"
We are already swimming in a chemical soup, more is not better. What many young artists fail to recognize is the cumulative nature of both particulate and chemical poisons associated with many arts and crafts. Minute amounts of substances inhaled or absorbed through the skin build up over time, unnoticed. Case studies demonstrate that onset of an illness often triggers the first awareness of what has been a chronic exposure. This is especially true where the addictive nature of the toxin is substantial. Many who acknowledge the health risks do not realize the risk to their artistic careers. In many cases, loss of the ability to work with the medium is the result of exposure. As a boy I built models, working very closely with paint and glue. The same glue that others became addicted to inhaling. Later it was auto customizing. Then a couple years in the printing trade, where several co-workers became addicted to toluene, a common solvent. Today I am hyper-sensitized to solvents and will be sick from any but the least toxic paints, even though wearing a quality carbon filtered mask. The first step is knowing your materials. The Labeling of Hazardous Art Materials Act is primarily oriented to children's art materials. Items labeled "conforms to ASTM D-4236" can generally be considered safe. "I could have told you, Vincent..."
Since the hazards are so many and difficult to quantify, let's focus on one VOC chemical art exposure: oil painting. In oil paint, small pigment particles are suspended in a drying solvent oil. While metal ions present in the pigment may be toxic, the main exposure risk is from aerosol solvents and thinners. Solvents such as turpentine and petroleum distillates are used in painting primarily to thin the paint or medium, and should then evaporate from the paint film or oxidize without leaving a trace. These solvents are also used to clean tools and brushes. Turpentine, still occasionally used in classic style oil painting, has a fast evaporation rate and a low permissible exposure level. Turpentine is the only toxic solvent available to painters that is easily absorbed through healthy, unbroken skin. Turpentine is considered to have "inadequate warning properties", because its odor threshold is 200 parts per million (ppm) parts of air. This figure is double the Occupational Safety and Health Administration(OSHA) permissible exposure limit of 100 ppm. We can't smell it well enough to protect ourselves, though at about 175 ppm symptoms of irritation will be undeniable. Long term exposure is associated with diseases including; dermatitis, kidney and bladder disease, asthma, and respiratory tract cancers. An art studio is not a residential air quality application. We are dealing with a near industrial setting. The key is continuous emitting sources of volatile organic chemicals and particulates. While air purifiers can help, no air cleaner can completely eliminate this type hazard: an artist's first line of defense should be continuous ventilation. Exhaust fans at the window or heating duct level, as well as near the work-space should be installed. For the struggling artist this does not have to be prohibitively expensive. Awareness of the hazards is free. Small work station exhaust fans and window fans are cheap. Confining the emitting process to a small area which can be steadily ventilated is highly recommended. While sources cannot be completely removed, sequestering them is recommended. Avoiding the open can of turpentine while working, and having an outdoor space for brush washing and other cleanup are a start. Personal protection, in the form of gloves, aprons, and activated carbon respirators should be considered. Eating, drinking, and smoking should be done with clean hands, away from the work space. Use of solvents to wash hands is to be avoided, some say baby oil works. GOOP industrial hand cleaner is probably less toxic than solvents. For high particulate dust situations, where painting with pastels, grinding, plaster mixing and carving, sculpting or other cutting take place, consider a high volume electrostatic precipitator paired with smaller HEPA machines. A vacuum cleaner repair facility I know, with heavy incoming dusts, uses electrostatics in tandem with HEPA units. Units with fixed filters, like, a bigger Blueair, when used alone, will clog frequently, raising filter costs. And with fixed-plate electrostatics (Ionic Pro, Ionic Breeze, Oreck...), be prepared to wash the electronic plates daily. Yes, every day in harsh environments. An exception is pottery studios, where clay and glaze dusts in submicron sizes can remain permanently airborne. Here, professional quality HEPA filters with strong blowers are needed. Normally, for all these quasi-industrial chemical environments, I would recommend nightly high dose ozone or other oxidant treatments. These are done while the rooms are unoccupied, with venting in the morning. However, where the oxidation would likely damage, discolor, or accelerate the drying of the art work in progress, this may be problematic. For VOC solvents, as in the oil painting studio, you need heavy activated carbon filters and a powerful fan. Studios with multiple users/students/clients/campers should consider the legal issue. My German tort-law professor would exclaim "widows und orphansz, in other verds: potential plaintiffs!" IQAir® New Edition GC MultiGas at Amazon.com. Be ready to replace carbon filters much more frequently than recommended for residential installations. For these environments, run air purifiers and ventilation on 24/7, on highest speed consistent with quality work. Full speed nights and weekends is recommended. they did not know how, perhaps they'll listen now."